Lightships were floating lighthouses anchored in areas where it was too deep, expensive, or impractical to construct a lighthouse. Lightship WLV 605 was built by the Rice Brothers Shipyard in Boothbay, Maine, and was one of six lightships constructed by the Coast Guard. She was commissioned in 1951 and served at Overfalls lightship station off Delaware coast. In 1959 she was transferred to the Blunts Reef station off Cape Mendocino, where she served until 1969. 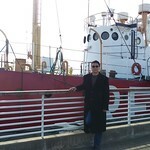 In 1969 she was assigned as “Relief” for all West Coast lightship stations. She was retired from duty in 1975, and decommissioned the following year. The WLV-605 is one of a small number of only 22 surviving American lightships in the United States and she is the last lightship in California. It was designated a National Historic Landmark in 1990.